The extremist group said Poroshenko won't be able to flee from the country in the event of a coup, as did his predecessor Viktor Yanukovych in February of 2014, the Voice of America (VOA) reported, citing Artem Skoropadsky, the press secretary of the Right Sector. "If there's a new revolution, Ukrainian President Petro Poroshenko and his supporters won't be able to escape from the country, as did the previous president. They can't expect anything, but an execution in some dark basement carried out by a group of young Ukrainian soldiers or members of the National Guard," Skoropadsky warned the current president, as quoted by VOA. Kiev declared a manhunt operation. In response, the Right Sector staged rallies across Ukrainian cities, including Kiev, demanding the resignation of Interior Minister Arsen Avakov. Currently, there is a split between the Kiev regime and the union of several nationalist groups led by the Right Sector. Interestingly, a year and a half ago, Petro Poroshenko's team and the Right Sector worked together during the Maidan protests ousting previous president Yanukovych. After the last year coup, the nationalists went to Donbass planning to annihilate Donbass residents who opposed Poroshenko's government. Kiev was actively supporting the nationalists fighting in the eastern part of the country, but the government never had full control over these radical groups. Having started collaborating with the Right Sector for the Donbass war, the Ukrainian government is now in some kind of a trap. On the one hand, Kiev needs radicals to wage the war in the east, on the other hand, the Right Sector discredits Ukraine for its Western partners. The nationalists ended up with lots of arms and battlefield experience, and now they're strong enough to openly challenge the government. Right Sector Tearing Ukraine Apart: Can Kiev Tame Rogue Nationalists? 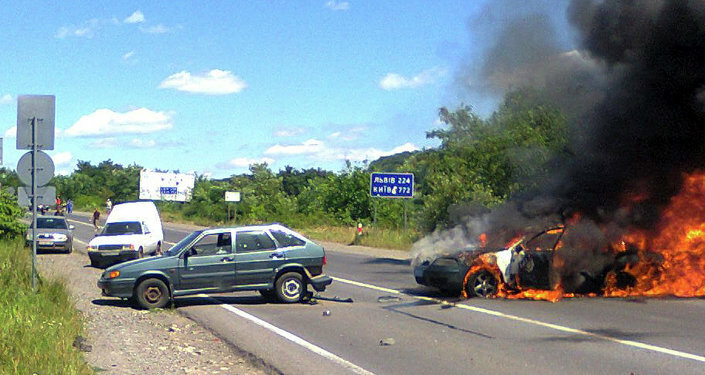 The Right Sector poses a threat of further escalation. Citing the group's spokesperson, Der Spiegel said that the nationalists were ready to send two armed formations to Kiev. Two of their units are stationed in Donbass, and there are 18 or 19 more battalions awaiting orders. On Monday during a briefing of the National Council for Security and Defense, Poroshenko demanded that the Interior Ministry, the Security Service of Ukraine, and other law enforcement agencies disarm all illegal armed groups operating in Ukraine. 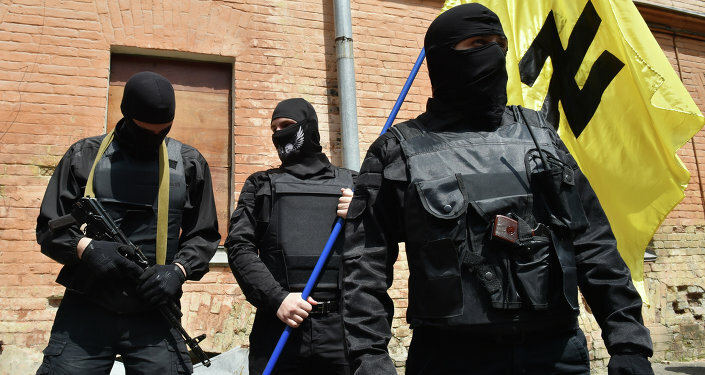 The Right Sector refused to lay down arms saying it is not an illegal armed formation, but "a volunteer corps which protects the sovereignty and territorial integrity of the Ukrainian nation." The Right Sector was formed as a coalition of nationalist and neo-Nazi organizations during the Maidan protests in Kiev at the end of 2013. In November 2014, Russia's Supreme Court blacklisted the Right Sector as an extremist organization and banned its activity in Russia. Earlier, Russia launched a criminal case against leader Dmitry Yarosh for public incitement of terrorism.